You might be surprised to learn that this mystery city is not all about extravagant, record-breaking real estate developments, luxury shopping and fast cars. It has a slower, more traditional side too. In the days before fossil fuel powered air-conditioning, wind tower houses like the one pictured above kept occupants cool in the searing heat and wicked humidity of this desert by the sea. Wind is drawn down into the tower and cooled by water standing at the bottom before circulating through the building. Can you name that city? Country? What about the site? This mystery city is DUBAI. Dubai is one of seven emirates in the United Arab Emirates (UAE). 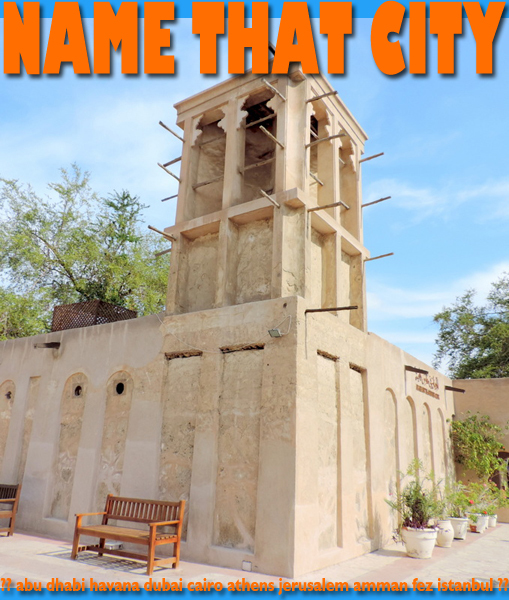 The wind tower house pictured is in Dubai’s historical Bastakiya district. Click to see Dubai tours. This entry was posted in Arabian Peninsula, Dubai, name that country quiz, UAE, Uncategorized and tagged bastakiya, Dubai, UAE, United Arab Emirates by yalla2013. Bookmark the permalink.